This weekly chance to add your reading list is hosted by Kathryn at Book Date. Bout of Books was this past week, and it did wonders for my reading. My library books are due this Wednesday. Before Bout of Books, I had four books to finish, and I didn't know how I could possibly get them done. But I'm now on the last one, and there's hope that I may get it read before Wednesday. Readathons are awesome! It's Bout of Books time! I'm hoping to get a lot of reading done this week. Usually, I'm frantically trying to get my classroom ready for the school year - but I'm staying at home with my little guy, so I don't have to do that this summer! I've got four library books to finish before they're due next week. This readathon came at the perfect time! This readathon was way more successful than I thought it would be. I finished four physical books and one audiobook. There's hope that I may actually get my library stack done before the due date on Wednesday! 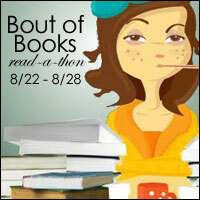 As always, I had a amazingly fun time participating in Bout of Books, and I'm looking forward to the next one! It's Monday, and the Olympics are over. :-( I'm typing up this post during the Closing Ceremonies (which means it's taking me a lot longer than it normally would to do. . .). I love watching the Olympics, whether it's having it on in the background during the day or watching at night after my little guy is in bed. I love the way the Olympics pulls the whole world together into these common events. I'm ready for the next Winter Olympics to start! Think of your favorite book. It may be one from your childhood, or one you just picked up last week. Either way, you've read it by now. You know the ending. You've seen how all the parts connect. You can only reread it next time, rather than experience that first reading full of "aha!" moments. The fact that you can only read a book for the first time once was brought home to me a couple of weeks ago when Harry Potter and the Cursed Child came out. It had been nine years since I had last held a new Harry Potter book in my hands. I've read the original series so many times that the details have become second nature to me. What would it be like to have a fresh, new Harry Potter experience? New plot, new characters, new piece of that world. This got me thinking about other books I wish I could experience for the first time again. I'd love to read Pride & Prejudice without knowing the happy ending and how they got there. Can you imagine being on the edge of your seat for Elizabeth and Darcy, rather than knowing exactly how they're going to get to walk down the aisle? The Lion, the Witch, and the Wardrobe is another book I'd love to read with fresh eyes. My mom read it to me as a child, and I've read it so many times since. But I wish I could read it again for the first time, not knowing what was going to happen to Aslan. It's been busy for me recently, so not a whole lot of reading has gone on. Our town had their summer festival this week. Then we helped my brother move into a new apartment on Saturday, and went to a family reunion on Sunday. Busy weekend, but a lot of fun! I am typically a fairly voracious reader. I read at least 100 books a year, and I always take great pleasure in setting my Goodreads goal to challenge myself. But this past January, I only set my Goodreads goal for 50. You see, I was having a baby in April. And I didn't know exactly how that would change my reading, but I knew it would. But since my little boy has arrived, I've had to increase my Goodreads goal to 75. And then 100. As of right now, I'm actually 25 books ahead of schedule. It turns out that having a baby can actually increase your reading time. Audiobooks! I honestly didn't have much use for audiobooks before. I'm a very visual person, so I didn't get as much out of books when I listened to them. It also drove me crazy how tuning out for a moment meant that I had totally lost the thread of what was going on. But now, I've discovered that audiobooks are awesome for all those moments when your hands are busy but your mind isn't. And there's a lot of those sorts of moments with a newborn. Keep your books close. I always make sure my current read is next to me before I sit down to feed my little guy. But there were lots of times when I would head to the glider in the nursery to rock him to sleep, and I wouldn't have a hand available to carry my book. So now I keep a book on the table next to the glider. I only get to read it while I'm rocking him, so it takes me awhile to get through. But it's right there every time I need it. Visit the library. Pre-baby, I thought this would be the perfect chance for me to finally read all of my unread books that sit neglected on my shelves. Surely I wouldn't feel up to going out all the time, so it would be easy to just select something that I already owned. Yeah, not so much. I'm reading almost solely library books now (except for the one next to the rocker in the nursery, because it takes me three months to get through one of those). Library books come with a deadline, which makes me more likely to pick them up in the evening, instead of crashing in front of the TV. I know I'm far from the only book blogger out there with kids. What are your tips for reading with little ones around? It's almost time for another Bout of Books! Have I mentioned recently that readathons are one of my absolute favorite parts of the blogging world? Well, they are! This will be the fifth Bout of Books that I've participated in. Typically, this one falls while I'm frantically trying to get ready for a new school year. But now I'm staying home with my little guy, so I have different things taking up my time. Even so, I'm hoping to carve out some time every day to read! Well, it's been a busy and bookish week. The new Harry Potter arrived on Monday. Wednesday was Library Day, with all the glories of bringing home a much larger stack than I intended to. And then Friday was book club. With all that wonderful bookishness, I just didn't have a chance to post last week. And it's not looking real good for this week coming up either, since it's our town's summer festival. I'm really looking forward to experiencing our festival for the first time with our little boy! Happy August, everybody! July went by extremely fast, capped off by a lazy weekend full of thunderstorms that my little guy surprisingly slept through (I don't know how he did that). Now it's on to busy August. Book club this week - at a campground! I can't wait for s'mores over a campfire!